Today’s stats include both early voters and returned absentee ballots, so we can get an overall sense of who has already voted. There are some substantial changes in county rankings from when I ran these numbers just yesterday. 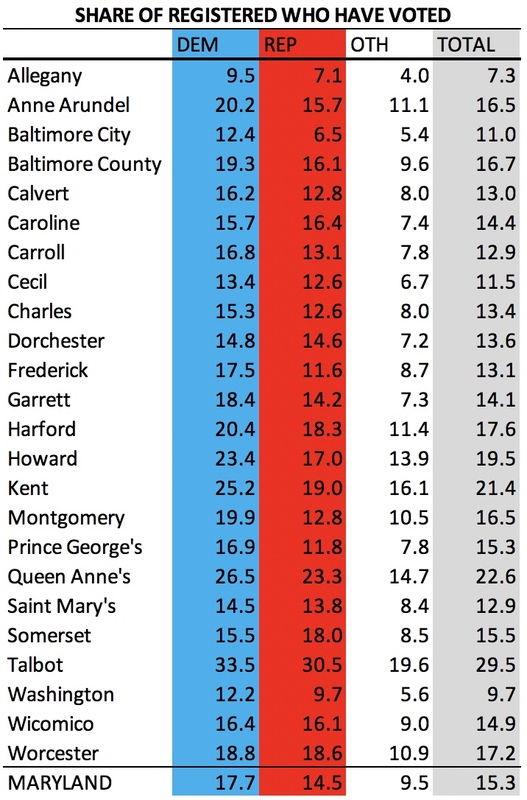 Specifically, Prince George’s has gone from being towards the bottom of the pack to virtually the same as the state average. 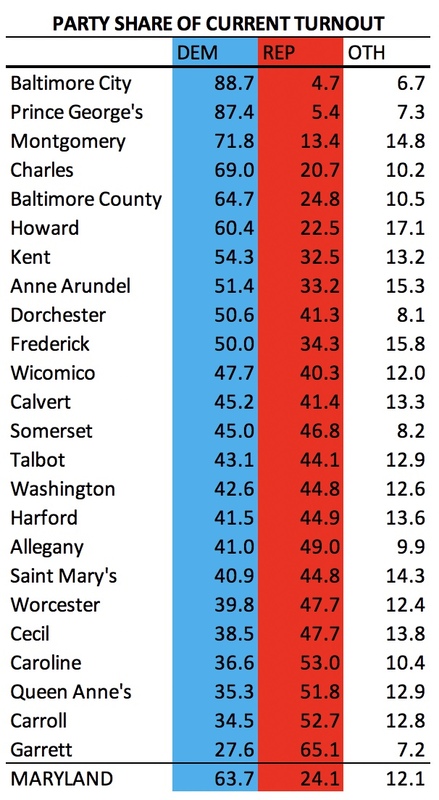 St. Mary’s has fallen several places from being 14th to 20th in turnout out of the state’s 24 jurisdictions. However, Talbot continues to lead the pack with just under 30% of its voters have done their civic duty compared to just 7.3% in placid Allegany. 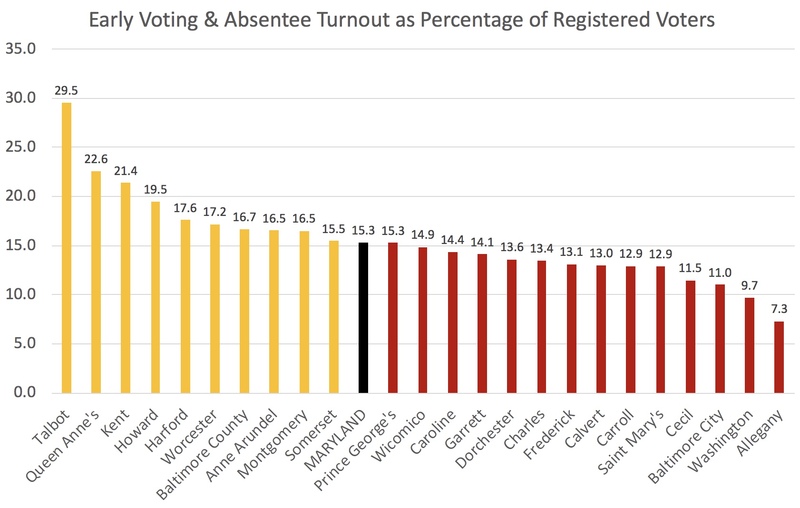 Overall, 15.3% of registered Marylanders have voted as of the end of the seventh day of early voting. Democrats have a 3.3% lead (difference from math based on the chart due to rounding) over Republicans in participation in early voting and returning absentees. Montgomery Dems continue to lead the way for their party with Democrats out voting Republicans by 7.1%. One might attribute this to MCDCC having gotten their organizational act together and the weak organization of local Republicans. Is there also a Ficker Factor? Ficker is a peripatetic one-man band but not well organized or supported. State Republicans seem unenthusiastic with Larry Hogan avoiding him at a recent rally and Kathy Szeliga failing to include him on a list of key races in her email blast. As Adam Pagnucco noted, Republican primary voters have repeatedly rejected Ficker when given the opportunity. In Howard, it has gotten more imperative for Allen Kittleman to turn out election day voters as Democrats have out participated Republicans in by 6.3%. In Frederick, Democrats are 5.9% ahead of Republicans, which can’t hurt County Executive Jan Gardner and Sen. Ron Young’s reelection bids. Democrats are also notably ahead by 4.5% in Anne Arundel where Republican County Executive Steve Schuh is facing surprisingly strong competition and Sarah Elfreth hopes to win John Astle’s open seat. Among the state’s 24 jurisdictions, exactly one-half have more Democratic than Republican voters and vice-versa. Notice, however, that all of the state’s really large jurisdictions are in the top portion of the chart and have substantially heavier Dem turnout. Earlier today, the House of Delegates overrode Gov. 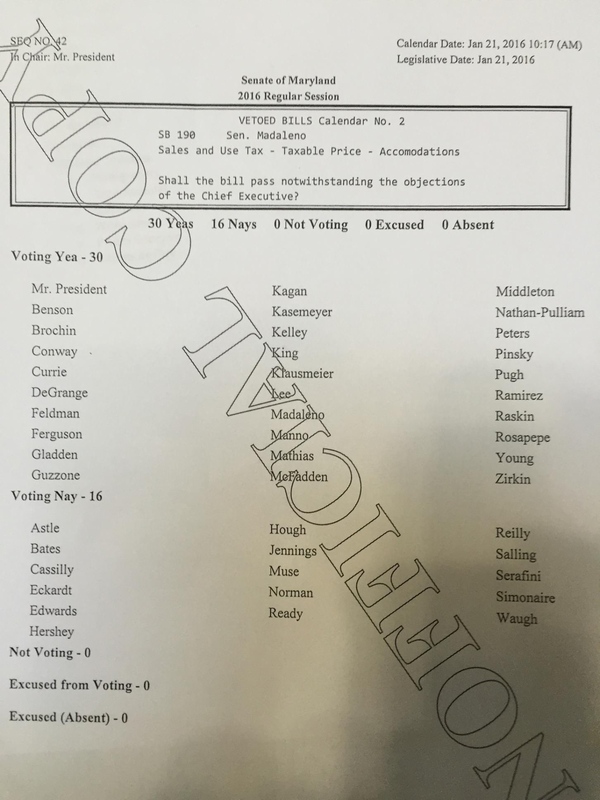 Larry Hogan’s veto of Cory McCray’s bill to restore ex-felon voting rights by a vote of 85 to 56–the exact number of votes needed to achieve the 60% needed to override a gubernatorial veto. Based on my quick scan of the board, six Democrats voted with the Governor: Del. Eric Bromwell (D-8, Baltimore County), Del. Ned Carey (D-31A, Anne Arundel), Del. 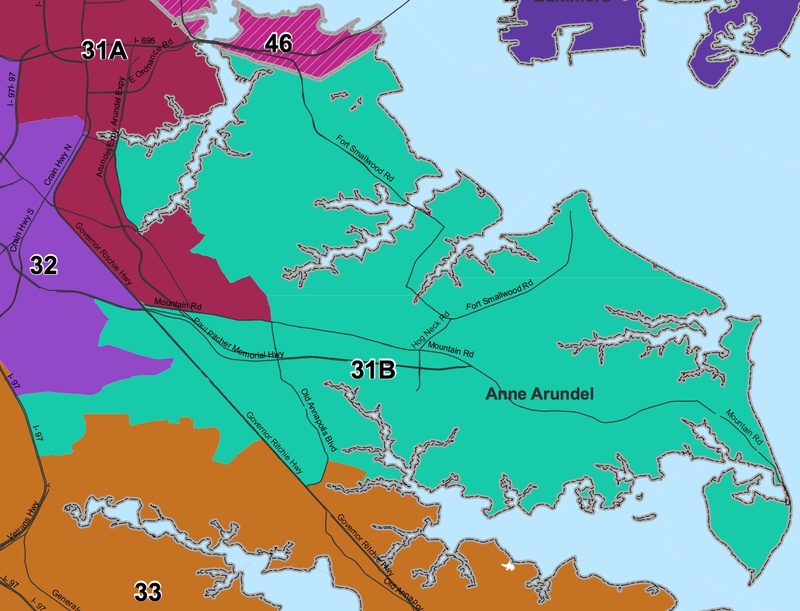 Mark Chang (D-32, Anne Arundel), Del. Ted Sophocleus (D-32, Anne Arundel), Del. Mary Ann Lisanti (D-34A, Harford), and Del. C.T. Wilson (D-28, Charles). Wilson was the only member of the Legislative Black Caucus to oppose overriding the Governor’s veto. One Republican, Del. Glen Glass (R-34A, Harford), voted with the Democrats. House Speaker Mike Busch and Dels. Pam Beidle, Ben Barnes, Herb McMillan, Ned Carey, Barbara Frush and Joseline Pena-Melnyk voted in favor of the override. Dels. Nic Kipke, Tony McConkey, Ted Sophocleus, Seth Howard, Meagan Simonaire, Mark Chang, Sid Saab and Michael Malone voted against. Republican Del. Herb McMillan (R-30A), who represents the same district as Speaker Busch, supported the override. Democratic Dels. Mark Chang (D-32) and Ted Sophocleus (D-32) voted to uphold the Governor’s veto. UPDATE: I am told that Dels. Chang and Sophocleus changed their votes verbally after the recorded vote on this bill. 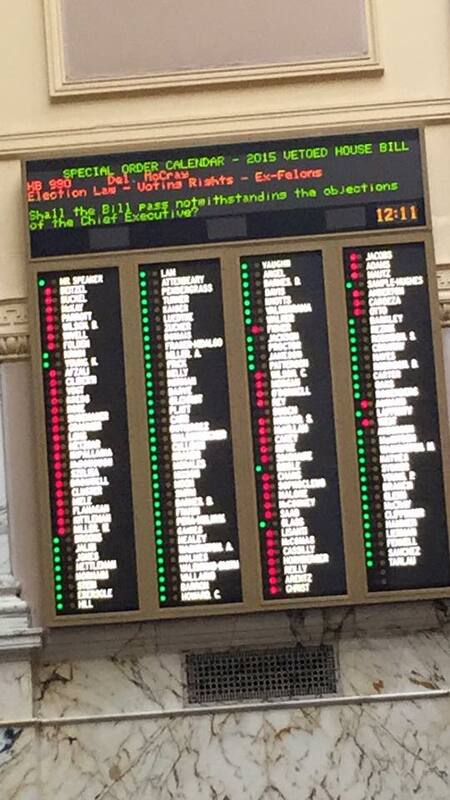 As a result, no Anne Arundel Democrats voted against the Speaker in the final official vote count. 1. Duwane Rager– Sue Kullen is one of three real pick up opportunities for Team Blue this year–the others are Nick Scarpelli and Patrick Murray. Duwane, her Campaign Manager, stands to benefit immensely, if she pulls it off. Duwane is also the President of the Southern Maryland Young Dems and a member of the Calvert Central Committee. Anonymous The Southern Maryland Young Democrats President, a member of the Calvert County Democratic Central Committee and the Campaign Manager for Sue Kullen’s campaign for Delegate. He is a great guy and someone who is really going places in the region. 2. Scott Moore – Scott’s a rare breed in Maryland Politics–a professional. He’s done work for Marylanders for Marriage Equality, the the Pennsylvania Senate Democratic Caucus and the Virginia House Democratic Caucus. I’ve always felt that out of state work is a signal of great talent. 3. Ben Goldstein-Smith – Super nice, solid dude. Currently managing Steny Hoyer’s reelection. I think the quote speaks more to his talents than I ever could. Anonymous: Four years ago, Ben was a field coordinator on Nancy King’s Senate re-election. This year, he is serving in his second year as Executive Director of Hoyer for Congress. Talk about moving quick. 4. Anne Klase – Anne is part of Comptroller Peter Franchot’s small, close knit circle (along with Andrew Friedson and Len Foxwell). Anonymous: Anne is District 30’s go-to. Hardworking, balanced, and liked by everyone. Anonymous – works for the Comptroller (floats between the campaign and the office) but don’t hold that against her. 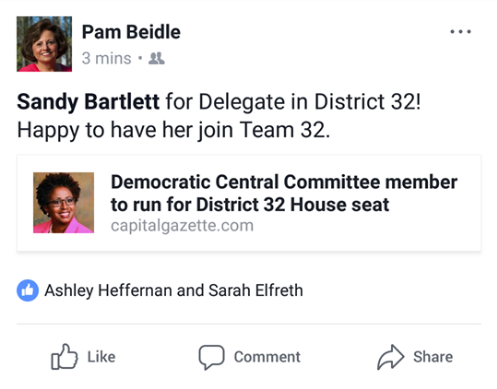 She’ll be elected to the AAC Central Committee in June. In a county with few strong Dems (and the strong ones can sometimes be divisive), Anne is universally liked and respected. She is young (23/4) and has a long career ahead in AA politics.